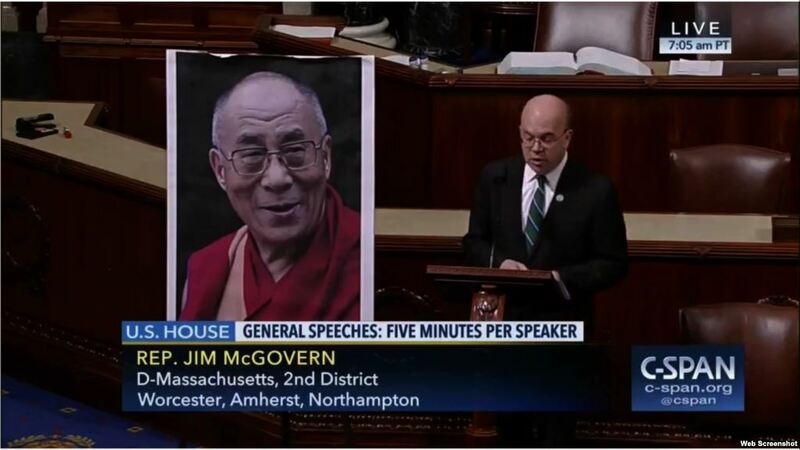 (TibetanReview.net, Dec16, 2017) – Addressing the US House of Representatives on Dec 14 during its special order period, Congressman Jim McGovern, a senior House Democrat and co-chair of the bipartisan Tom Lantos Human Rights Commission, has cited Article 13 of the Universal Declaration of Human Rights to call on China to affirm the Dalai Lama’s right to return to his home. Article 13 of the Declaration affirms that “Everyone has the right to leave any country, including his own, and to return to his country,” he Has said, and called on the Chinese authorities to affirm the right of the 14th Dalai Lama to return to his homeland, “whether to visit or to stay”. Calling it a time for bold action – it being the week people all around the world commemorated the World Human Rights Day, the annual celebration of the adoption of the Universal Declaration of Human Rights – the congressman urged his colleagues in the House to speak out along with him in urging the Chinese Government to do the right thing. For “now is the time to raise our voices, now before it’s too late,” he has concluded.